Bhutan is unlike any other destination in the world. Read on for some of the best places to visit in Bhutan! The Kingdom of Bhutan is a small country located in the eastern Himalayas with India to its south and sharing a border with China in the north. 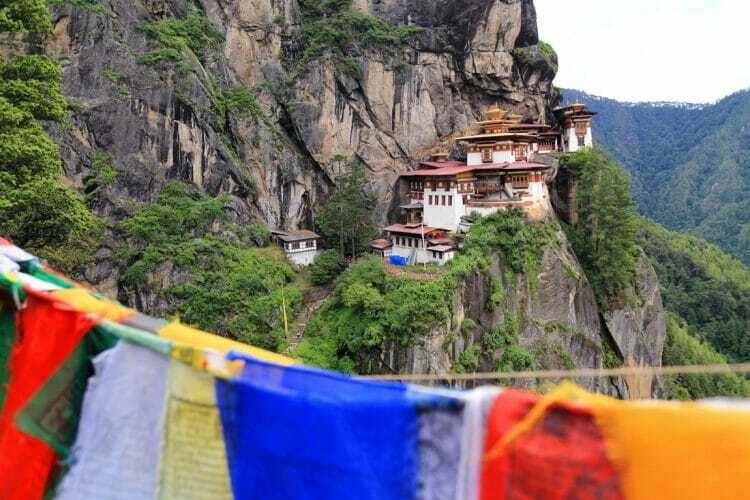 Though Bhutan is only a tiny dot on the world map, visitors travel to “The Last Shangri-La” for its rich culture, adventure offerings, pristine nature and spiritual landmarks. It is, without a doubt, one of the most uncrowded and untouched destinations I have ever had the privilege of traveling to, and offers an incredible immersive cultural experience that you don’t find in many places around the world anymore. Read on for some essential Bhutan travel tips, as well as a roundup of the best places to visit in Bhutan for first time visitors! 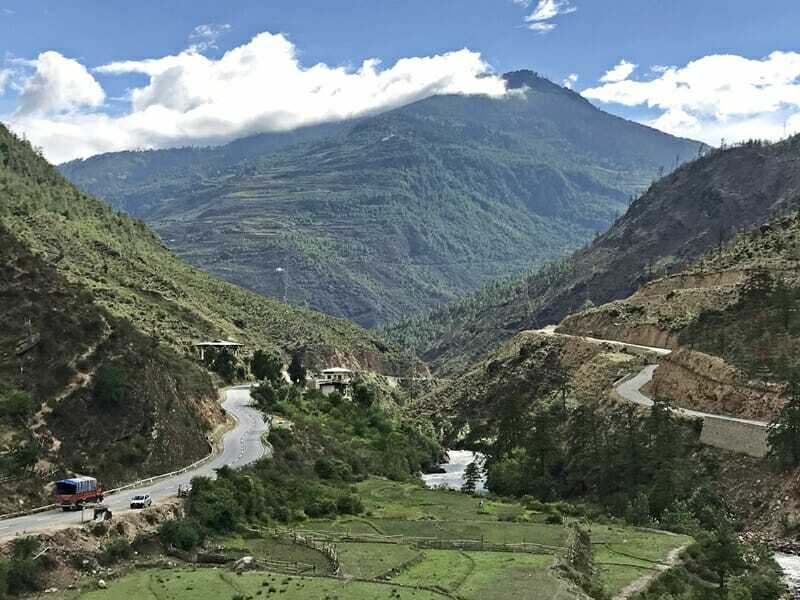 Here’s something you need to know about Bhutan: though places aren’t far apart, the roads are extremely winding and driving time is longer than you’d expect. To give you an idea, Bhutan is only 240 KM wide but it would take 2 days of driving to get from east to west. So how long should you spend in Bhutan? For first time visitors to Bhutan, I would recommend 7-10 days. 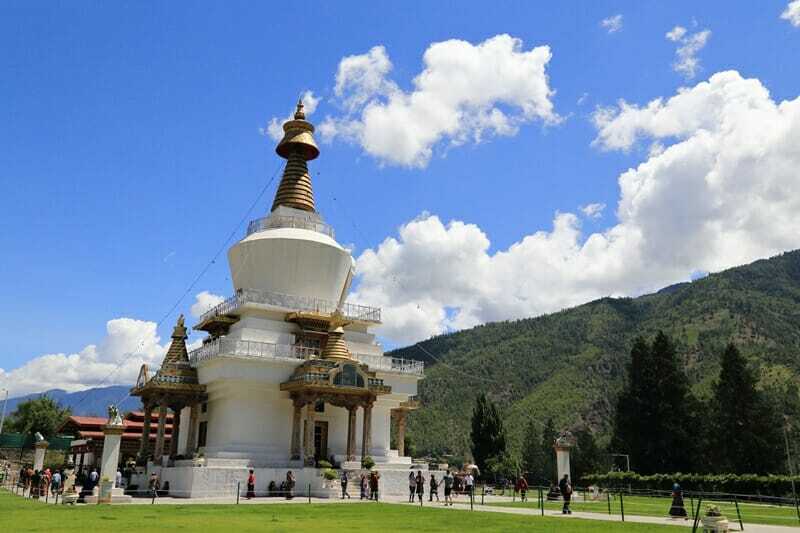 During that time, you’re likely to tour the Western circuit including Paro, Thimpu, Punakha and Haa Valley – you can explore these cities easily in 1 week. If you have more than a week, you can then venture onwards to places like Bumthang and Gangtey Valley in Central Bhutan. Cost: “How much does it cost to visit Bhutan?” This is probably one of the most frequently asked questions about visiting Bhutan. The fee changes with number of people in your group, the season, and which part of the country you are visiting. If you are traveling in a group of 3+ people, each visitor must pay US$200 per day in the off-peak season (January, February, June, July, August) and US$250 per day in the peak season (March, April, May, September, October, November). If you are traveling alone, you have to pay an additional US$40 per night on top of the minimum daily package fee, and if you are traveling as a group of 2 you pay an additional US$30 per night. What’s important to know is that this fee covers almost everything – hotels, meals, ground transportation, your guide, driver, and entrance fees. Tour company: Because the price of travel packages (hotels, drivers, guides) are fairly standardized in Bhutan, it is not a very useful comparison tool. What it really comes down to is professionalism, experience, reliability and ability to customize your itinerary and hotel preferences. We ended up planning our trip to Bhutan with Druk Asia, a Bhutanese tour company that has been in operation for more than a decade. Our guide, Nawang, was experienced, patient, dedicated and knew about everything there is to know about Bhutan. Druk Asia’s guides climb the Tiger’s Nest trail almost on a weekly basis so know the various paths like the back of their hands. 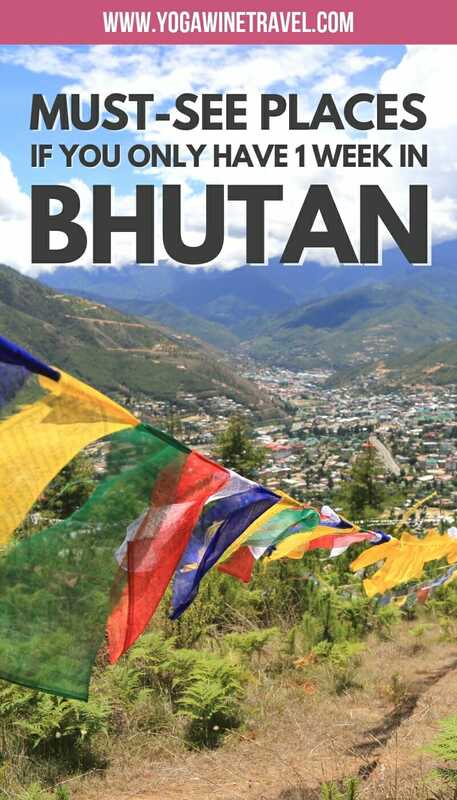 You can check out Druk Asia’s “Essential 7 Day Bhutan” itinerary here. Best time to visit: The short answer is, it depends on what you want to see. 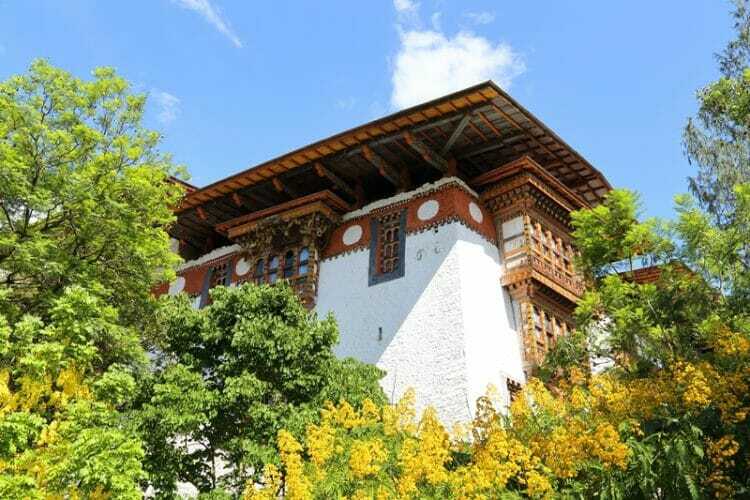 The peak season for travel to Bhutan is from March to May and September to November – Bhutan in spring is a sight to behold with flowers blossoming everywhere, and autumn is festival season. During spring and autumn, the days are cooler which makes them ideal seasons for trekking. The off-peak season for travel to Bhutan is from January to February and June to August. During the winter months, you can try to spot the black-necked crane, check out the special winter festivals or go snow trekking. The summer months are warm and the country is filled with blue skies and sunny days, though you can expect some light rainfall. You can trek to the Tiger’s Nest regardless of which season you travel to Bhutan in, even in the snow. You may want to avoid extremely rainy days as the path becomes very muddy and slippery. 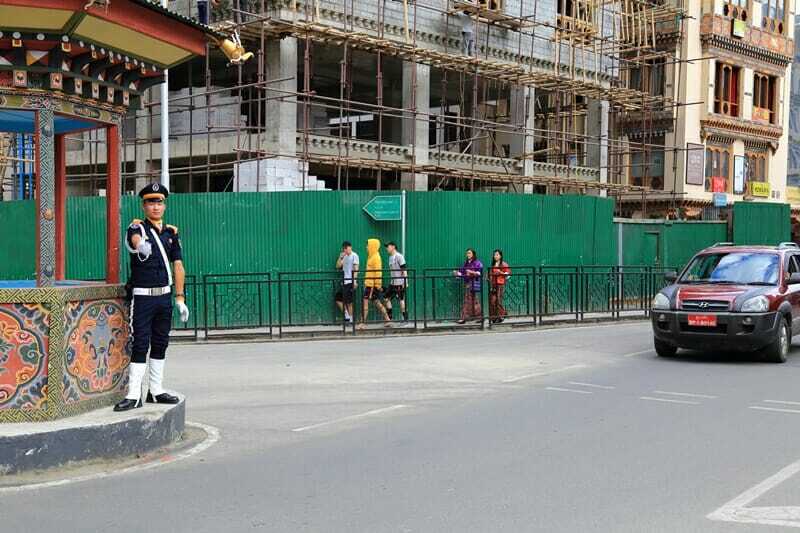 Dress code: In general, people tend to dress more conservatively in Bhutan though it isn’t an issue to wear short sleeve tops or shorts if you are walking around. Druk Asia can also arrange traditional Bhutanese attire for you to wear if you’re interested – the gho for men, or kira for women. 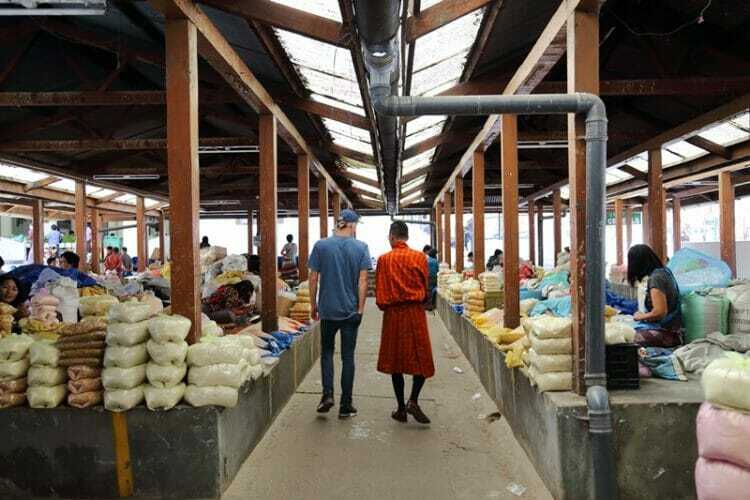 When visiting any fortresses (Dzongs – where Buddhist monks reside), temples or other religious sites in Bhutan, you must adhere to a strict dress code. You have to wear long pants/dress and long sleeved tops (not enough to just cover your shoulders with a shawl), and hats/caps must be removed. 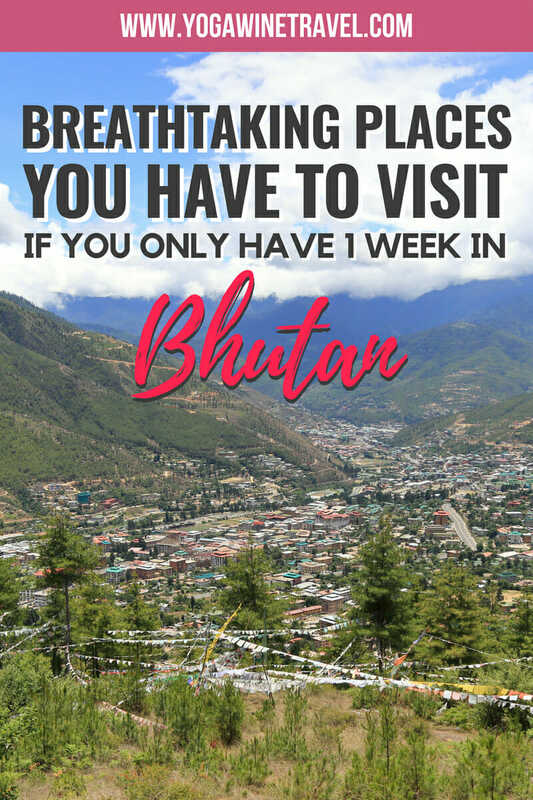 Don’t leave these top places off of your Bhutan itinerary if you only have 1 week in Bhutan! 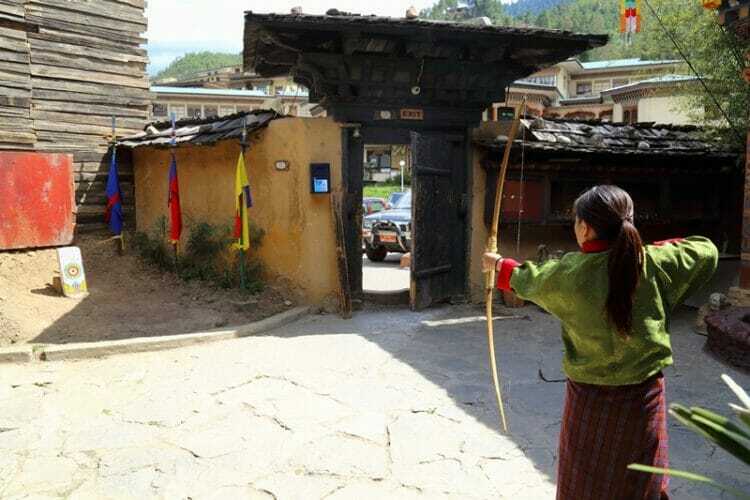 Once you land in Paro International Aiport, hop in the car and head to Thimpu, just 1 hour away by car. 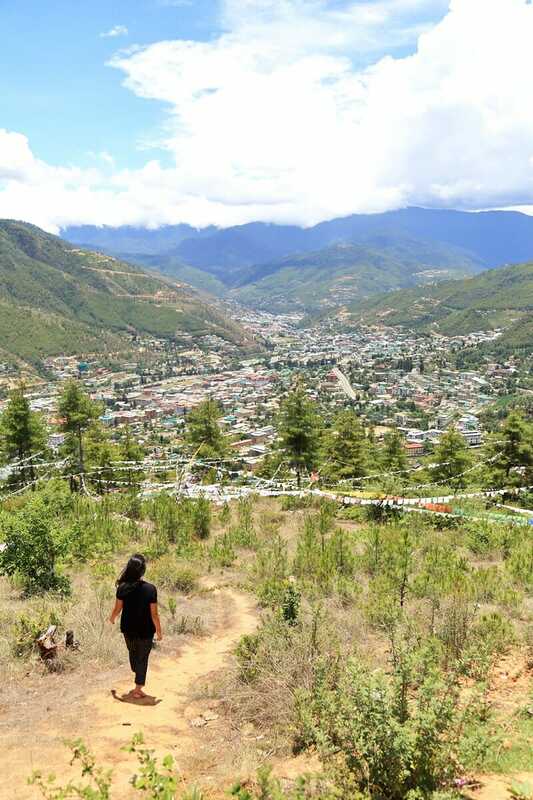 Thimpu is the capital of Bhutan (the only major capital city without any traffic lights!) and is home to approximately 100,000 inhabitants including the royal family. This is where you’re likely to get your first taste of Bhutan. 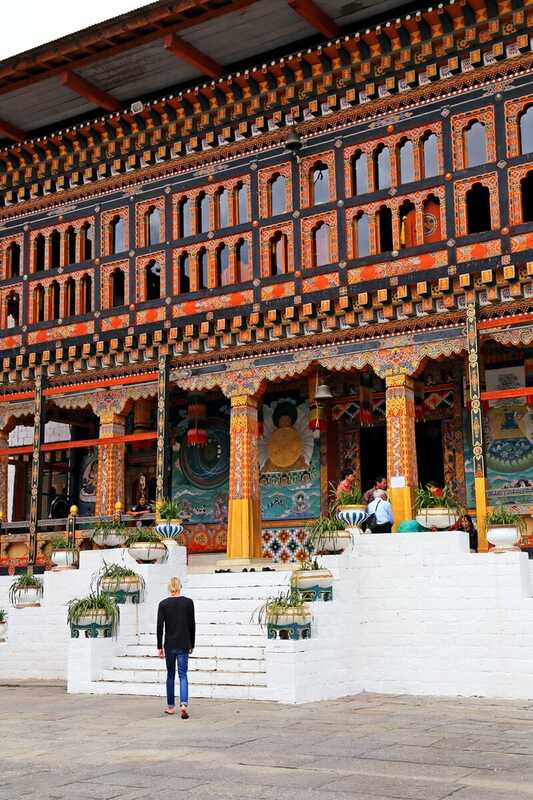 Here are some must-visit places in Thimpu. 1. Tashichho Dzong: Tashichho Dzong has been the seat of the government since 1952 and also houses the King’s office. His modest residential palace is also nearby and he oftens walks to work. This fortress is also the summer residence of the Chief Abbot and monastic body. It is also the location of the Thimphu Tsechu, one of the grandest Bhutanese festivals featuring dances performed by monks in colourful masks and costumes. 2. 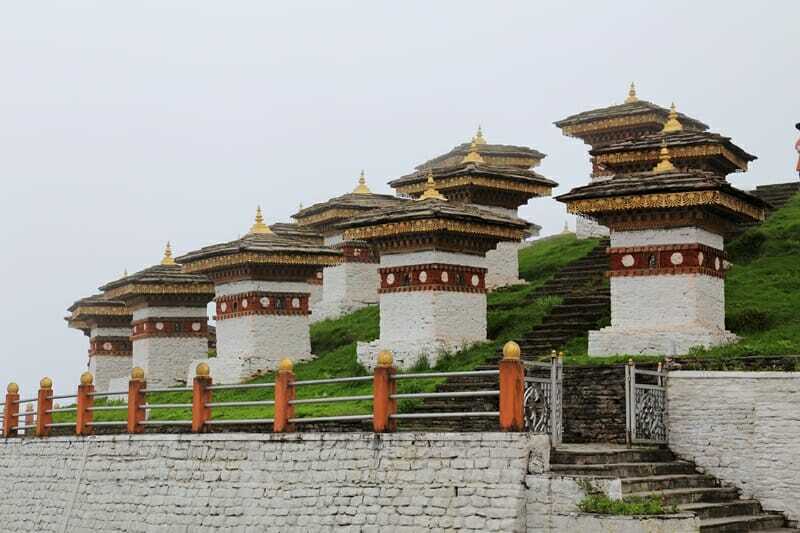 Simtokha Dzong (or Semtokha): Legend says that this castle fortress was built to subdue an evil spirit. 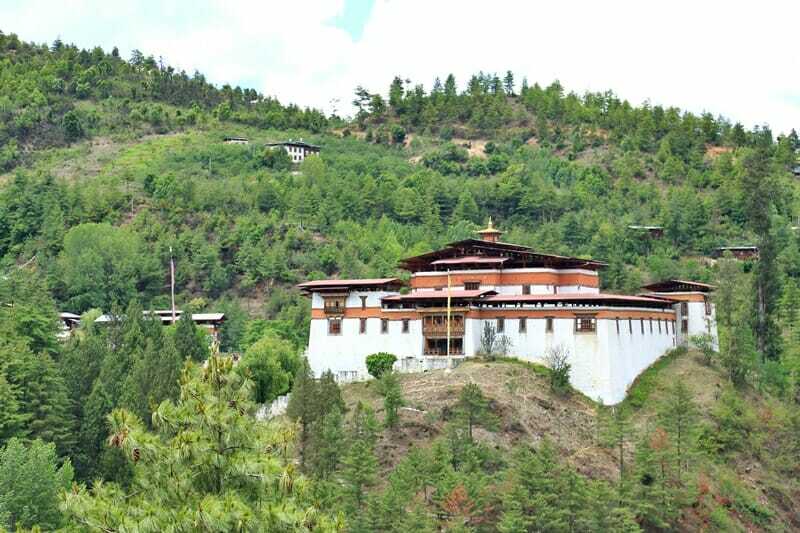 It is the very first dzong in Bhutan and was built in 1627. It is not home to the Institute for Language and Cultural Studies. 3. 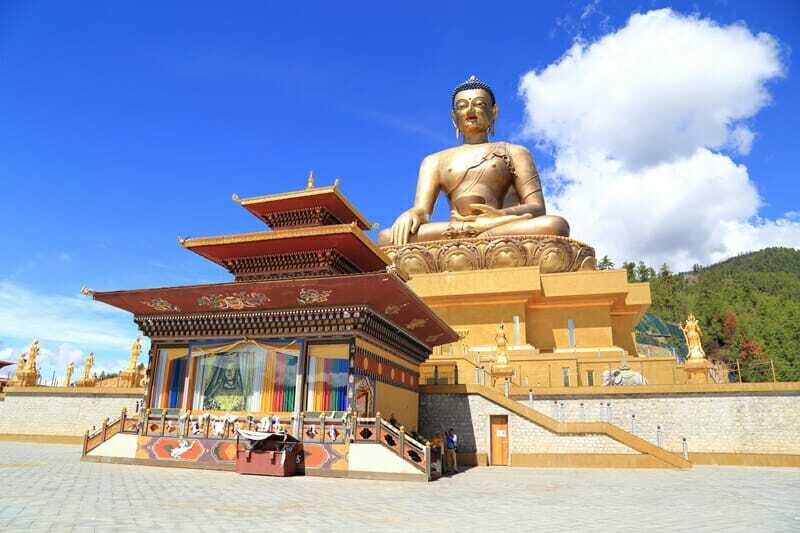 Buddha Point: The Buddha Dordenma statue is one of the largest seated Buddha statues in the world at more than 50 meters tall. It is made entirely of bronze and is gilded in gold! Explore the interior chamber with intricately painted walls depicting Buddha’s life and 125,000 smaller Buddha statues that line its halls. 4. Changangkha Temple: Changangkha Lhakhang is the oldest temple in Thimpu and was built in the 12th century. Though it is not a big temple, many people visit every day for prayer. Because it sits atop a mountain ridge, it offers awesome views across Thimpu town. 5. 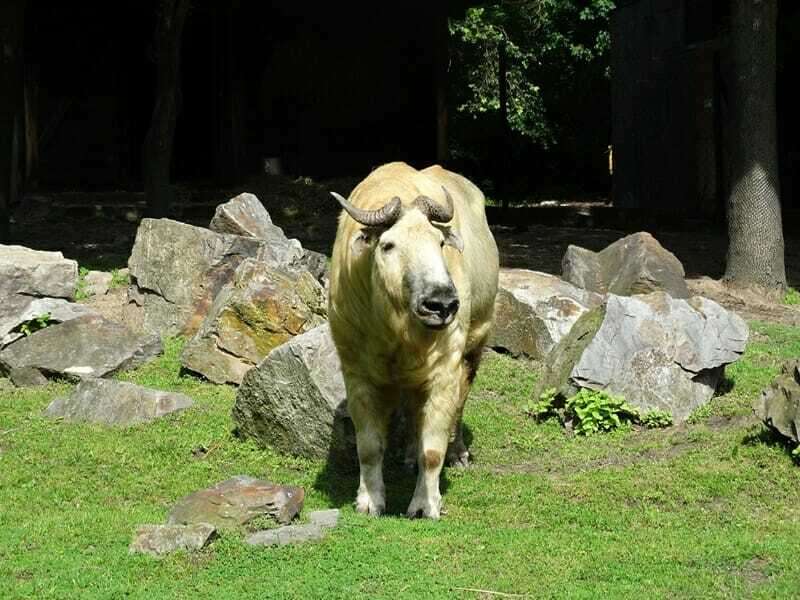 Takin Enclosure: A Takin is Bhutan’s national animal and is said to be the creation of the “Divine Madman”, a religious teacher who hailed from Tibet. He combined the head of a goat and the body of a bull to produce this strange looking creature. There are several takin families within this enclosure. 6. 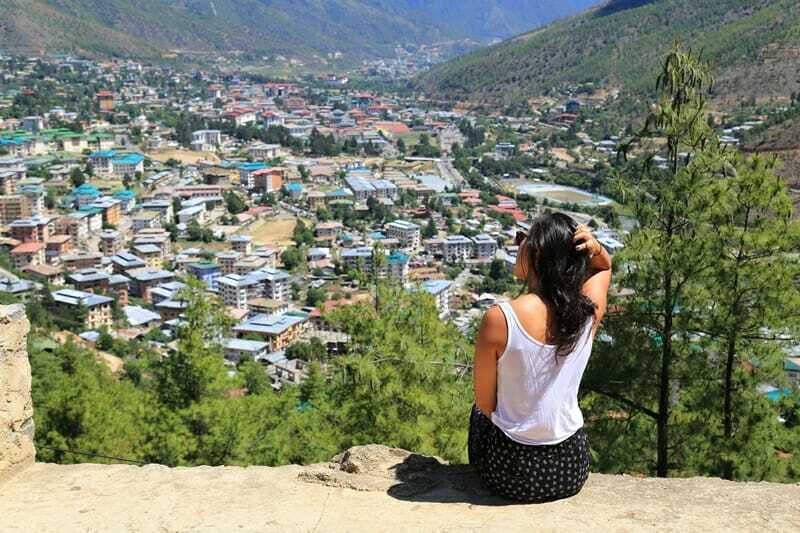 Sangaygang viewpoint (AKA BBS Tower): This viewpoint is a quick drive from the Takin Enclosure, and offers up the most amazing views across Thimpu. 7. 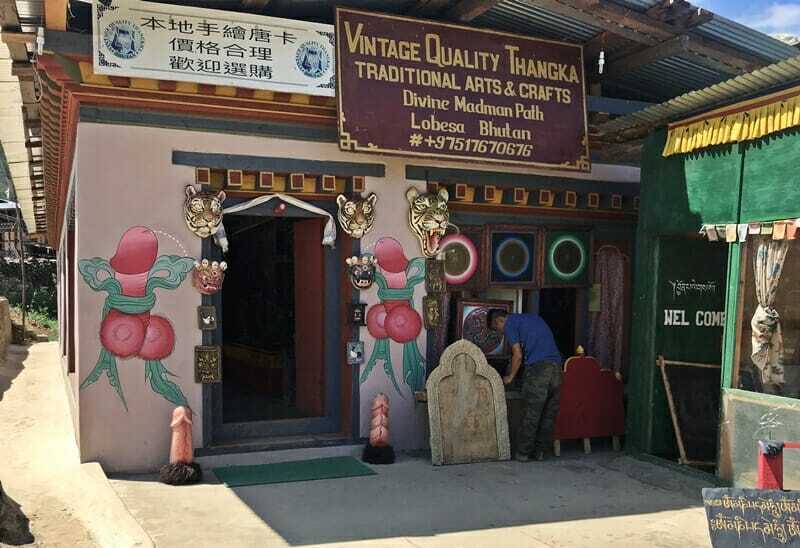 Simply Bhutan museum: The small museum showcases Bhutanese tradition and history, and you are led through exhibits that give you a glimpse into Bhutanese life through the years. 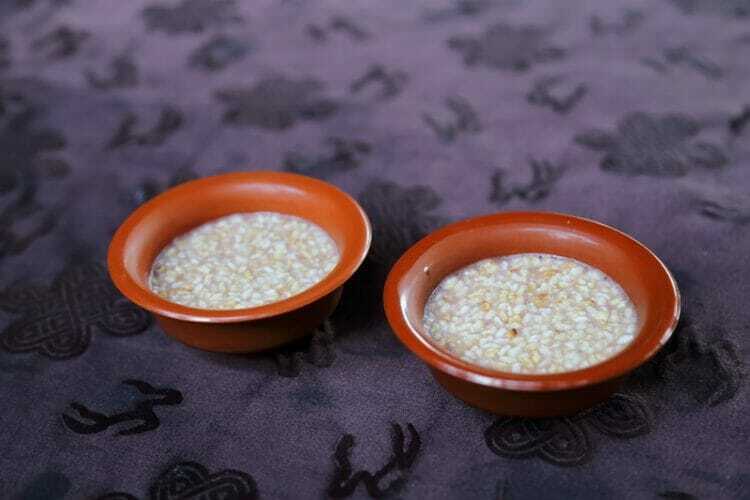 Try the “butter tea” and ara, a traditional rice wine (it packs a serious punch). 8. 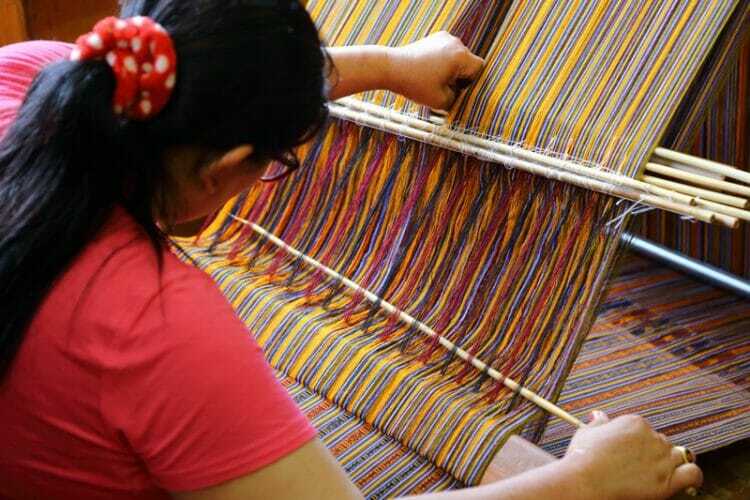 Textile museum: Another small establishment where you can observe the traditional art of weaving. There is a souvenir shop if you’d like to bring home a woven scarf or Bhutanese clothing. 9. 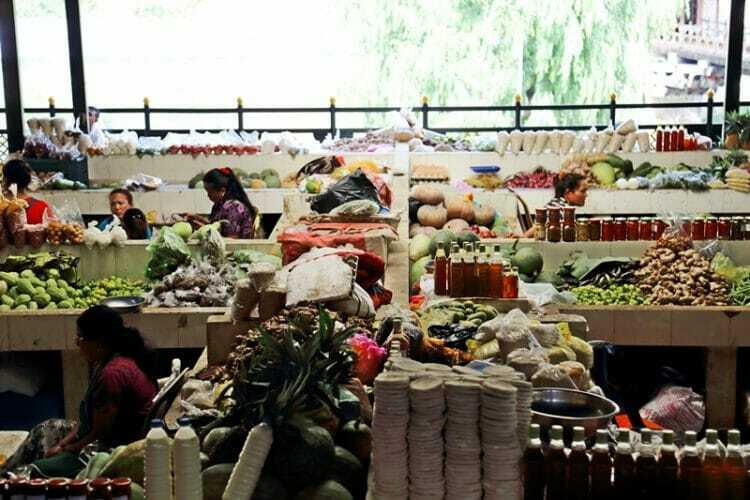 Centenary farmer’s market: A lively market that sells fresh produce as well as dried goods, grains, plants, incense, herbs and spices. 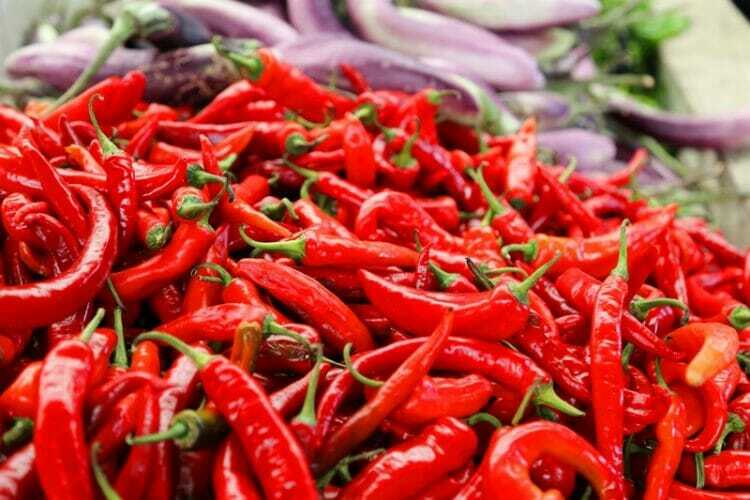 This is the largest domestic market in Bhutan – I don’t think I’ve ever seen so much chilli in my life! 10. National Memorial Chorten: The small chorten (temple) was built in memory of Bhutan’s third king. Step inside and check out the intricate sculptures and paintings depicting various deities. 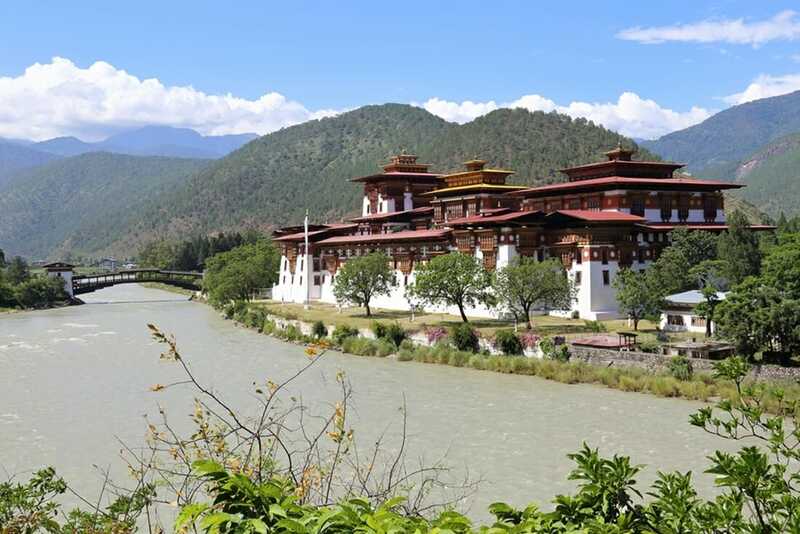 Punakha was the ancient capital of Bhutan and is located about 2 hours away from Thimpu via Dochula pass. It is 1,000 metres or so lower than Thimpu, so expect much warmer weather here and lush, green rice paddies across the valley. I didn’t know much about Punakha prior to our trip, but it captured my heart with its stunning landscape and beautiful male and female rivers. 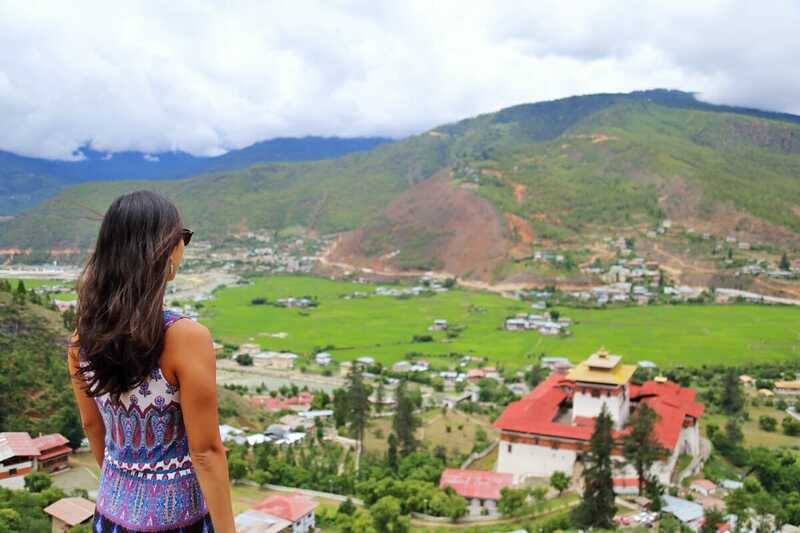 Here are some of the best places to visit in Punakha. 1. Dochula pass and Druk Wangyal Chortens: The pass is not strictly in Punakha – it is situated between Thimpu and Punakha. The pass is a popular viewpoint as it offers a stunning panoramic view of the Himalayan mountain range on a clear day. Unfortunately it was very foggy when we were there but maybe you’ll have better luck! The 108 chortens were built by the Queen Mother as a memorial for soldiers who lost their lives in a 2003 battle against insurgents from India. 2. Chhimi Lhakhang temple of the Divine Madman: Walk through rice paddies for 30-40 minutes to get to this famous temple of the Divine Madman. He is worshipped for many things, one of which is fertility, and visitors from around the world come here to be blessed – they even have a photo album of every couple that fell pregnant after visiting! The phallus is a symbol associated with the Divine Madman, and you’ll see plenty of phallus paintings and statues scattered around the local town. 3. Punakha Dzong: Punakha Dzong is situated at the junction of the “male” and “female” rivers, and is the winter residence of the monastic boy. 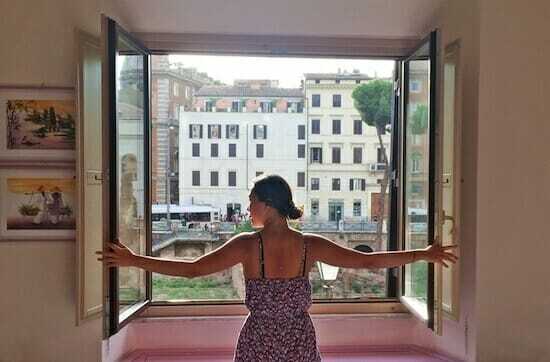 It was built in 1637 and houses both administrative offices as well as religious halls. The Punakha Dzong has incredible artwork detailing the life and teachings of the Buddha, as well as stunning architecture and open courtyards. 4. Pho Chhu suspension bridge: This colourful bridge is the longest in Bhutan – though I am terrified of heights and barely made it across (and back), local people regularly cross the bridge on a daily basis – sometimes with herds of cattle! Paro Valley is one of the widest in Bhutan and is home to more than 100 old monasteries and temples. It is also the location of Paro International Airport – make sure you check out the dedicated airport view point where you can watch the hair-raising plane landings! Paro is also where you will find the mind-blowing Tiger’s Nest Monastery. 1. Paro Dzong: Paro Dzong (or Ringpung Dzong) is a complex of courtyards and buildings where you will find beautiful frescoes (make sure your guide tells you about the difference between a bull on a rope and a tiger on a chain), meditation halls and prayer wheels. 2. National Museum: The national museum is a hidden gem in Paro. 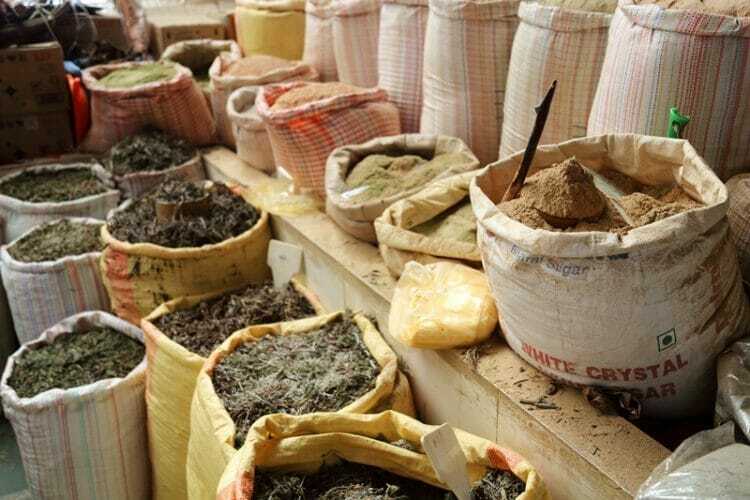 It displays hundreds of ancient Bhutanese artifacts and artwork including traditional costumes, pottery, scrolls, statues as well as an extensive exhibit on the nature and wildlife in Bhutan. You can not take photos in the museum and have to leave your personal belongings in a storage locker outside. 3. 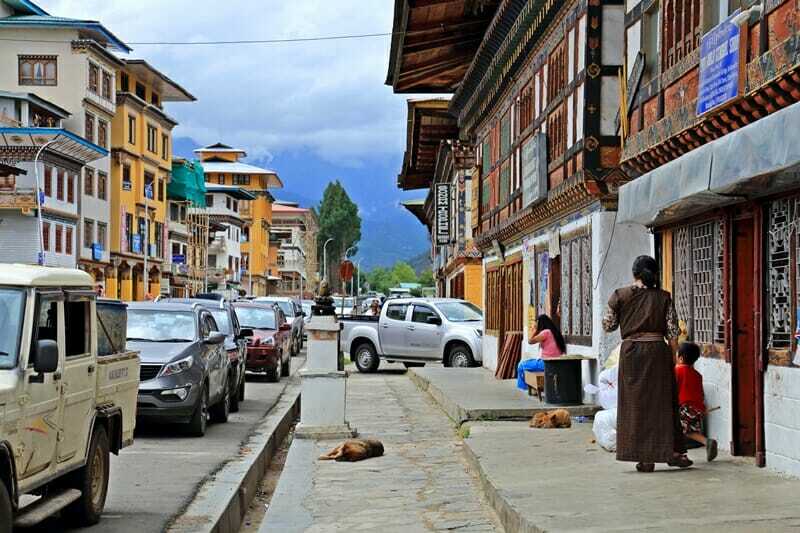 Paro Town: Wander through the local market as well as charming main street lined with souvenir shops and coffee joints. This is where you can do most of your souvenir shopping. 4. 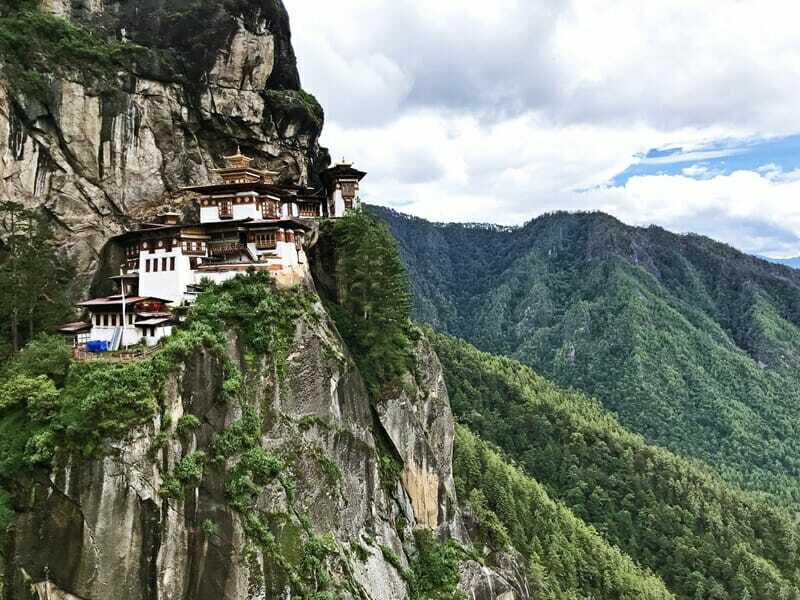 Paro Taktsang, or the Tiger’s Nest: Arguably the most famous landmark in Bhutan., it is believed that the second Buddha flew to this location on the back of a Tigress and meditated in one of the caves for three years, three months, three weeks, three days and three hours. Others say that it is called the Tiger’s Nest because tigers had been sighted in the caves deep within the mountain. 5. Kyerchu Temple (or Kyichu Lhakhang): This is the oldest temple in Bhutan and has 2 orange trees in the courtyard that are said to bear fruit all year round. The fruit are never picked – they ripen and are allowed to simply fall off the tree. Though it is small, it is believed that 108 temples were built to subdue a demon, one on each body part – Kyerchu sits on the demon’s left foot. Chelela Pass is the highest road pass in Bhutan (3,988 m) and is a 2 hour drive away from Paro. 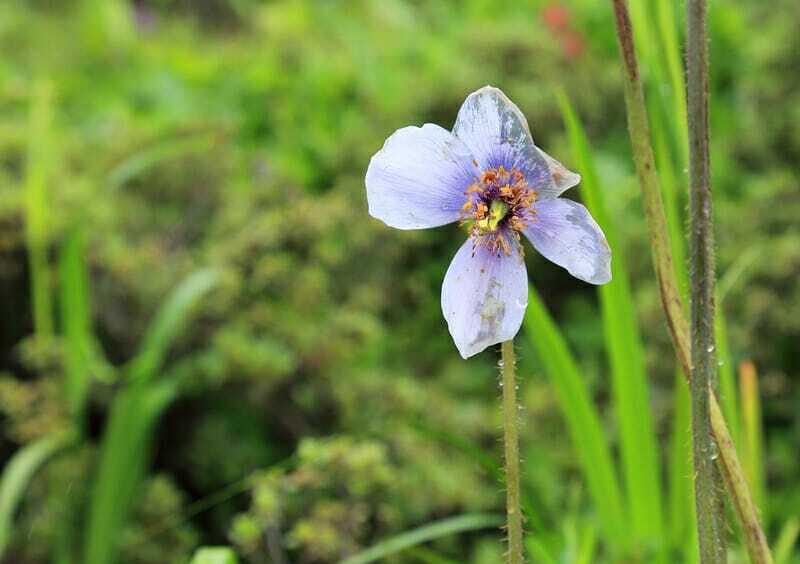 This stunning view point overlooks both Paro Valley as well as Haa Valley, and offers the opportunity to see Bhutan’s national flower, the rare blue poppy. Haa Valley is a small region that is largely untouched as it only opened to foreign tourists in 2002 and has maintained a very traditional way of life. 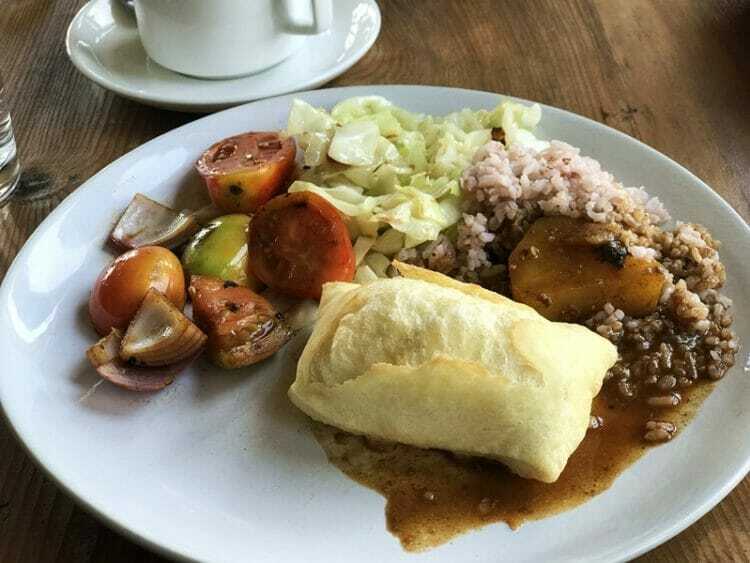 There are no tourist standard hotels in Haa so it is only visited as a day trip from Punakha. 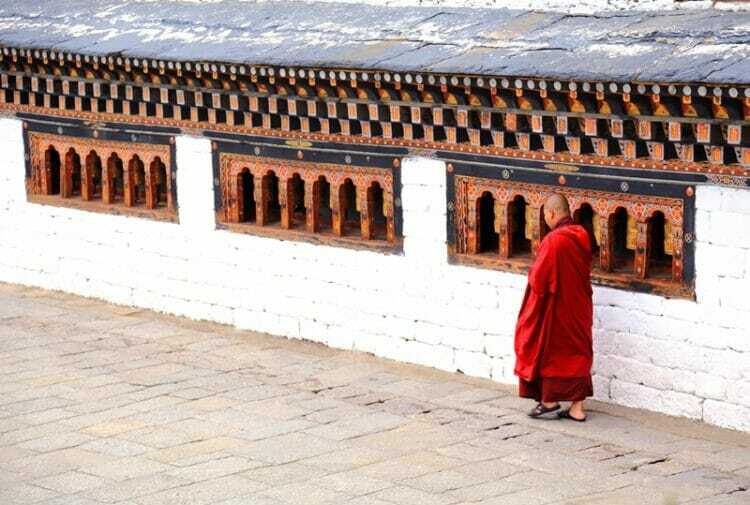 Check out the black and white temples in Haa Valley, built in the 7th century by a Tibetan King in his mission to build 108 monasteries in 1 day. 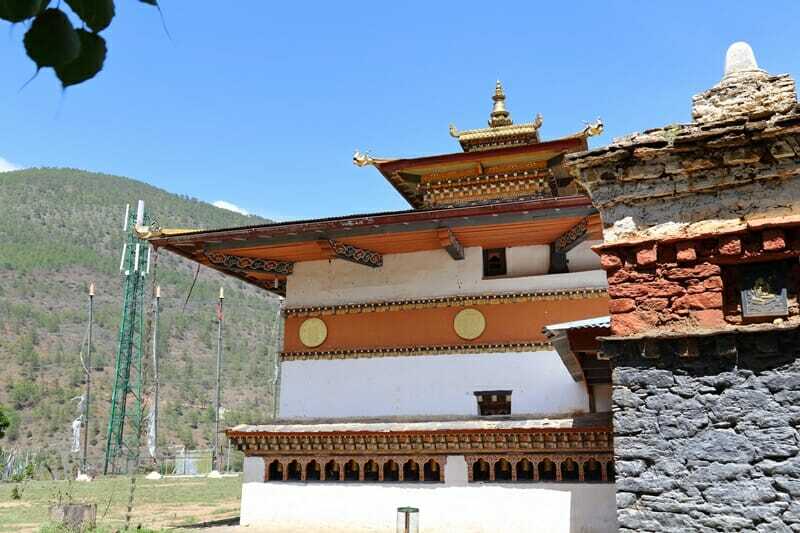 You can manage to cover a lot of ground in Bhutan in just 1 weeks’ time, but if you have a few extra days to spare you can explore Bumthang, largely considered the religious heartland of Bhutan, as well as Gangtey Valley. 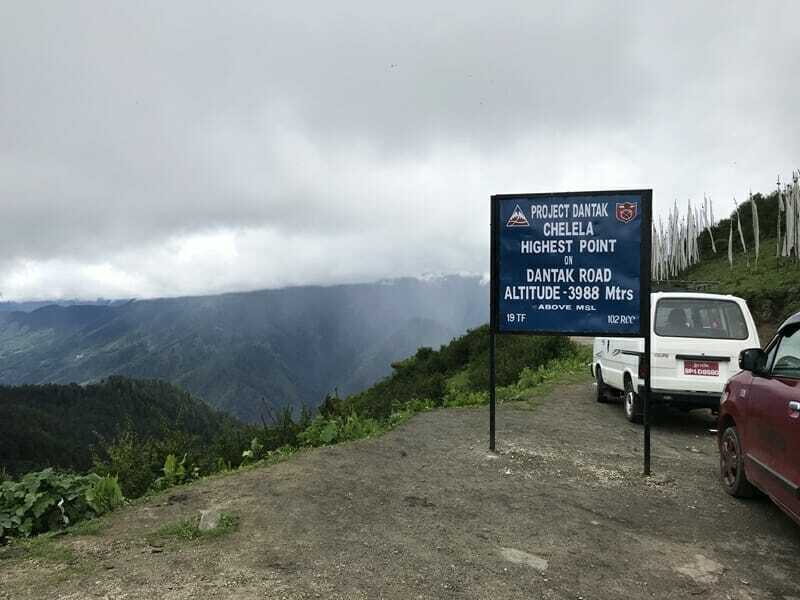 For those who are planning to spend 2 weeks in Bhutan or even longer, you can opt to go on one of the many multi-day treks around the country or head to the less-visited Eastern circuit of Bhutan. In my opinion, 1 week in Bhutan was a perfect amount of time to spend for a first trip, though I probably would have been happy to spend a few more days had we visited during festival season. If you live in Asia or Oceania, it is quite easy to hop over to Bhutan more than once over separate trips so you don’t “overdose” on the sights and food in one go, but it’s understandable for people who live further away in Africa, Europe, North America or South America to want to spend a few weeks in Bhutan to make the travel time worthwhile. 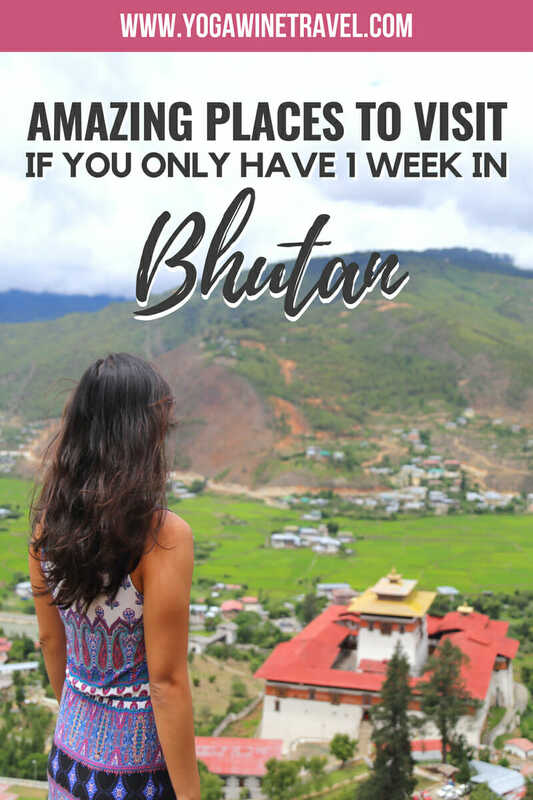 I hope this guide helps you better plan out your 1 week itinerary in Bhutan and what to see when you visit Bhutan! 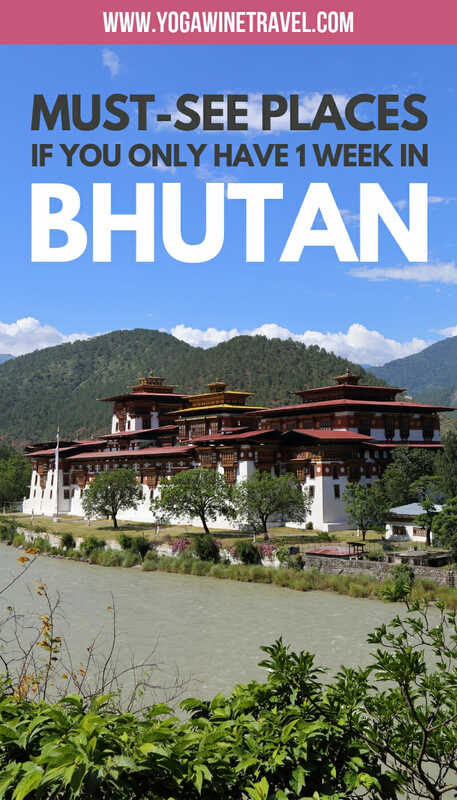 Feel free to leave me a comment if you have any questions that aren’t covered in this Bhutan travel guide.